We’re approaching the anniversary of the Cub’s big win after a multi-decade World Series losing streak, and fans are still celebrating. So, now is a good time to talk about how Swarthmore’s new residence hall shares a critical commonality with the Chicago’s Wrigley Field. Wrigley Field has many claims to fame, among those are the ivy-covered outfield wall, the Cubs, and a dedicated fandom. The best Cubs fans know that the field, originally Weeghman Park, was built in 1914. The cost of building Weeghman Park, which had a seating capacity of 14,000, was estimated at $250,000. The infield and outfield consisted of more than 4,000 yards of soil and four acres of bluegrass. But what does Wrigley have to do with Swarthmore? … A tradition older than the ivy-covered outfield wall and more fun that building materials stats is the ROOFTOPS- arguably the best seats in the house. The rooftops provide both a unique aspect over the field and all the comforts of home. 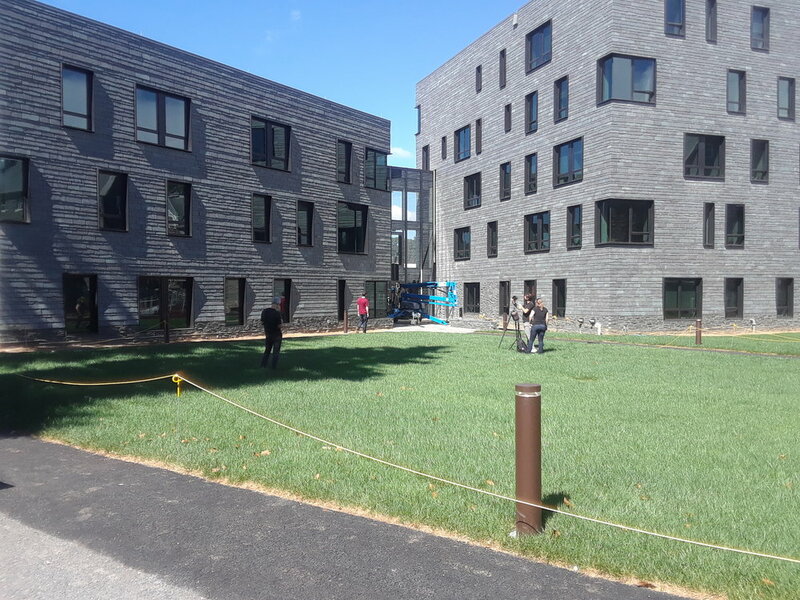 Meet NPPR, Swarthmore’s new residence hall and mini Wrigley field. NPPR is located at a nexus of student housing and college athletic facilities. To negotiate the limited space and proximity of these two uses, the building and site design combine edges. The new building shares a wall with the outfield and the rooftop terrace provides both a panoramic view over the newly modified baseball field and all the comforts of home – just like Wrigley field! The best part is rooftop tickets to Garnet Games are a steal (comparatively).